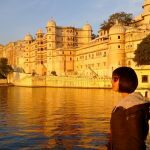 So, WizzAir postponed our flight to the Canary Islands and we had to spend one day in Bergamo which proved to be a fabulous stop-over. Next day’s plan included a commute via Valencia and landing on the island of Tenerife, but the said air company informed us we would have to spend the night in Spain’s third largest city. And why wouldn’t we explore the busiest container port (situated cosily on the Mediterranean Sea), and the 5th busiest in Europe? I have a friend living in the vicinity so he gathered us at the airport and lead us to the hostel we had booked. After that, we devoted the afternoon to looking around. La Ciudad de las Artes y las Ciencias, as its Spanish name goes, is probably the most mesmerising architectural complex I have ever visited. 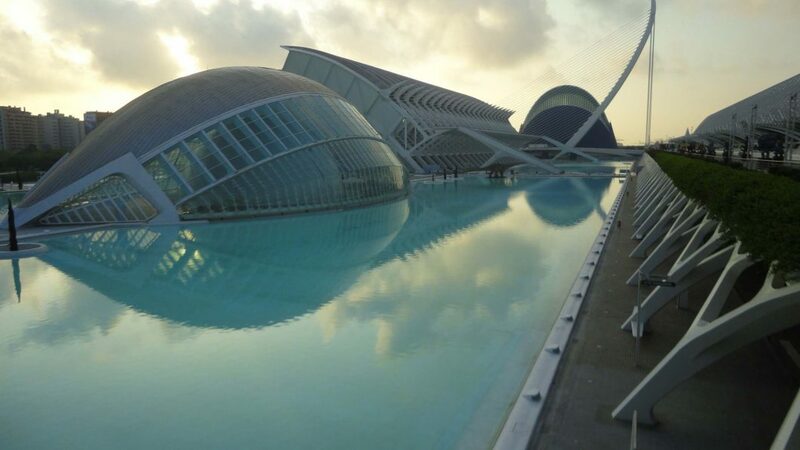 Built in neo-futuristic style, it is the most contemporary tourist attraction in Valencia and a part of the 12 Treasures of Spain (12 Tesoros de España). After a calamitous flood in 1957, the Turia River was drained and successfully rerouted. As a result, a marvellous sunken park emerged from the “ashes” of the old riverbed which stretches for more than 18km (11 miles). At the end of it is where the City of Arts and Sciences is cosily nestled. Construction began in 1996. 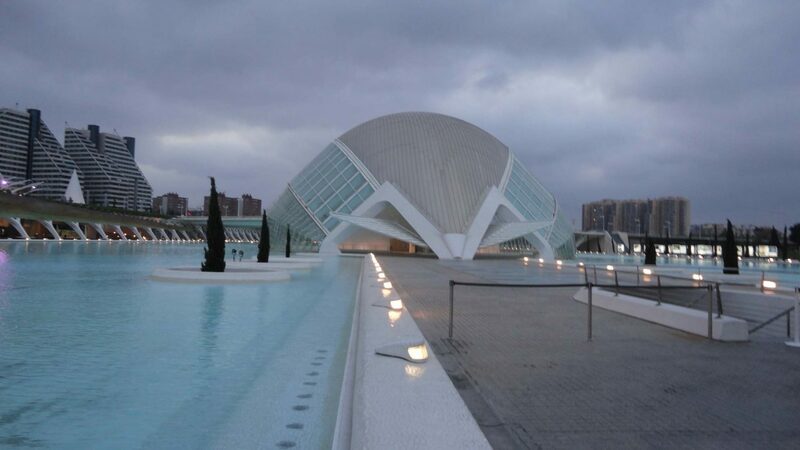 The final “city”, designed by the world-famous architects Félix Candela and Santiago Calatrava, was officially inaugurated in the spring of 1998 with L’Hemisfèric’s opening. L’Hemisfèric as seen from a distance. Closer shot of the building. The building looks like a gigantic eye. With my best (travel) friend. Palau de les Arts Reina Sofia or as it known in English – Reina (Queen) Sofía Palace of the Arts – was the last building of the majestic architectural complex. It saw its inauguration in October 2005. The Palace mainly serves as a cultural centre and an opera house for world-famous opera singers, including the Spanish Plácido Domingo. A night shot of the Palau de les Arts. Svet, Poli, and Bobo crackin’ the photo. Later, our friend took us near the port. On the way there, we were driving over one of the few Formula One courses. The city of Valencia used to be a site of the European Grand Prix of F1, but it was given the chop in 2013. 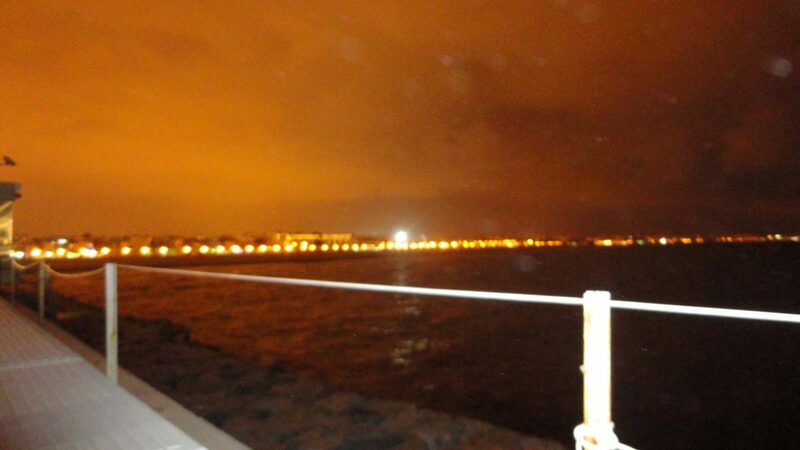 A bit of a blurry image of Valencia’s beach and port. Although we were not able to immerse ourselves into the gastronomic world of Valencia, as an incurable foodie, I have to mention the popular paella. It originates in the city of Valencia and epitomises slowly simmered rice with chicken (sometimes rabbit) and seafood. It is generously sprinkled with the world’s most expensive condiment – saffron – to which it owes its yellowish colour. The dish is known as paella Valenciana. Have you been to Valencia for more than a couple of hours? 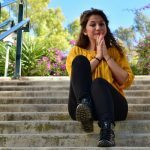 What would you recommend me visiting and tasting? 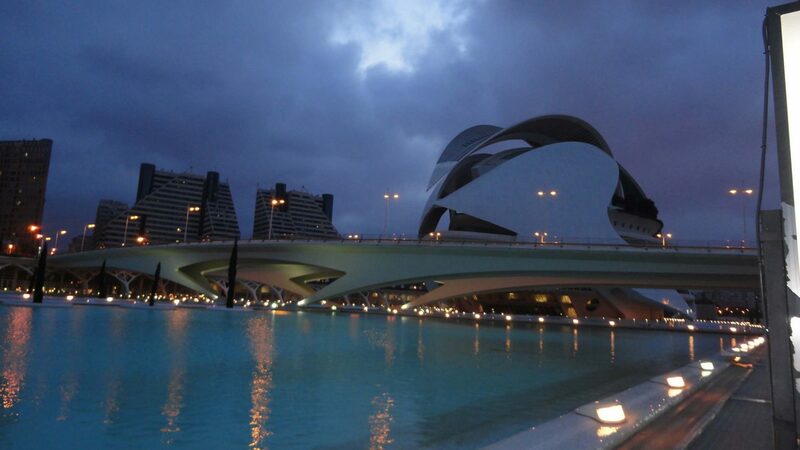 The city of arts and sciences looks incredible. It vaguely reminds me of an art museum I visited in Mexico City with the water pools. How did you find wizzAir? I fell in love with it! WizzAir is not bad for the price it offers. This was some years ago, but nowadays Wizz have been increasing their prices. Otherwise, it was decent. 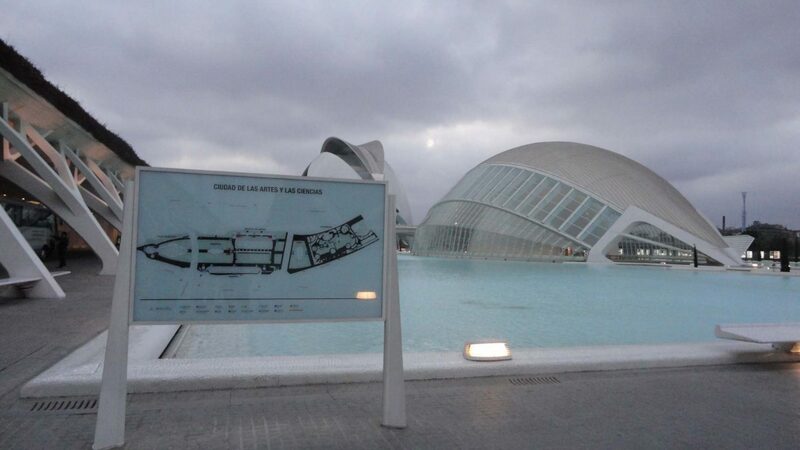 I was in Valencia e but had bad luck with really terrible weather so I didn’t visit this complex and really regret it. I would always take advantage of new things to see and do, if only for a couple of hours! I haven’t had decent paella since I was in Madrid in 2002, but it was so delicious back then I can almost taste it now! Yes, me too! I had two great cities to explore due to these consequences. Paella is one of my favourite dishes in Spain, so it is good everywhere :))) I am drooling now. Valencia is so charming. I am particularly fascinated by the L’Hemisfèric . It has an amazing architectural design. Indeed it is, Vyjay! I was captivated by its amazing design too! I love paella! That would be awesome to go on a food trip in Valencia. Sorry you only had a couple of hours there but seems like you made the most out of it. I love paella! 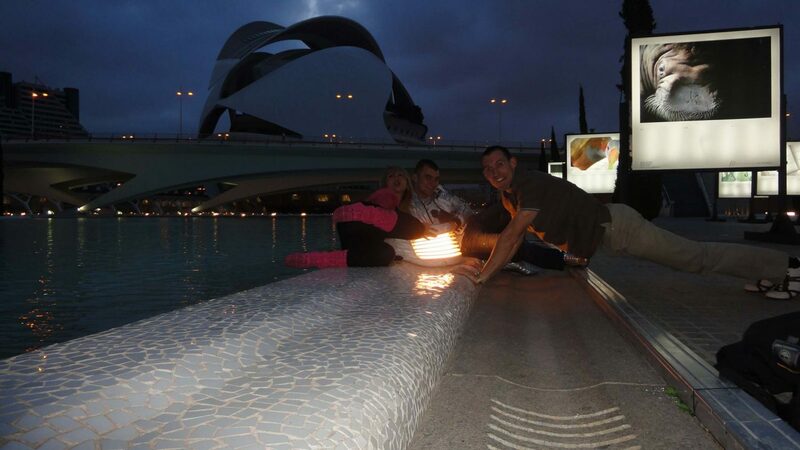 It would’ve been awesome if you got to go on a food trip in Valencia. Sorry you only had a couple of hours there but seems like you made the most out of it. We booked our flight to Valencia and we are soo happy! Can’t wait to discover the city! I will be very happy if you can recommend us something..
Hey, That is great! Unfortunately, as you saw, I was there only for one afternoon. Therefore, besides what I had written about the City of Arts and Sciences, I am not aware of anything else. Thanks for directing me here to read about this building. Very cool indeed and yes a small resemblance to the Oculus in NYC with all that white and a dome like shape. Oh, you are very welcome, Jo! 🙂 I am so happy you liked it. It does some small resemblance. What is the architect of the Oculus?